Over the last few years, Lucy Wood has been creating her own distinctive fictional worlds of Devon and Cornwall. Although the general settings are recognisable, the places are rarely named, which to me always gives a feeling that the worlds of Wood’s stories are unbound. Each of her books has had a different focus: the stories in Diving Belles have foundations in folklore; the novel Weathering revolves around the relationship between characters and raw landscape. Now we have Wood’s second story collection, The Sing of the Shore, which is an evocation of Cornwall off-season. An epigraph explains the book’s title: “the sing of the shore” is the varying sound of waves as they break against different surfaces (sand, pebbles, etc. ), which enables experienced fishermen to tell where they are even when it’s foggy – in other words, it represents the secret soul of a place, known to locals but not to outsiders. Unlike Diving Belles, there’s only a relative tinge of the supernatural in this book – but the sense of otherworldiness running through Wood’s work is as strong as ever. There’s sand everywhere around here. When you walk in the wind, grains crunch against your teeth. We’re out on the edge of town, where the cliffs start to crumble and turn to sloping dunes. The dunes are heavy and soft, like flour in a bowl. They never stay still. They slip and shift about; sometimes growing, sometimes flattening out. When the gales come, loose sand blows down the road and heaps at our front doors. This is from the story ‘Salthouse’, which begins with teenagers Evie and Gina going to plant their Christmas trees in the sand, as most people in the area do, in order to keep the dunes in place. On the way there, Gina suggests visiting the fair, yet seems reluctant to join in with Evie. It transpires that Gina has arranged to meet a boy, and Evie’s time at the fair becomes a kinetic dismantling of the childhood she thought she still had. Except, as the ending makes clear, some things don’t change: the sand is still there, advancing and receding as ever. ‘The Dishes’ provides another example of how Wood layers character and metaphor with a lightness of touch. In this story, Jay has moved to Cornwall with his wife Lorna for three months, where she has been seconded to a satellite ground station. Jay spends his time looking after the couple’s baby; since Lorna can’t talk about her work, a lack of meaningful conversation is getting to Jay (“All he wanted was to speak to someone and not have them say forofoo, or whatever the hell it was, back”). There are mysterious comings and goings at the neighbouring house, which also make him anxious. Wood paints an elegant study of a man succumbing to paranoia, out of little more than baby talk and next door’s phone ringing. There’s a great range of tone among the stories in The Sing of the Shore. ‘One Foot in Front of the Other’ invests a tale of a woman crossing fields and dodging cows with an atmosphere of genuine menace. ‘Way the Hell Out’ turns a conversation about a mysterious figure seen from a house into something of a shaggy dog story. ‘A Year of Buryings’ is a wry catalogue of the dead, who may persist (“Now someone’s tapping on windows. Who is it? It’s Jameson with his stick, out in the rain again, trying to remember where he used to live”); it reminded me of ‘Notes from the House Spirits‘ in Diving Belles. ‘By-the-Wind Sailors’ ends the volume on a melancholy note, with the story of a couple forced by circumstance to flit from house to house. A certain sense of transience may run through Wood’s tales in this book, but the stories themselves linger long in the mind. Watch Lucy Wood reading from the story ‘Home Scar’. Read other reviews of The Sing of the Shore at Shiny New Books and Caught by the River. 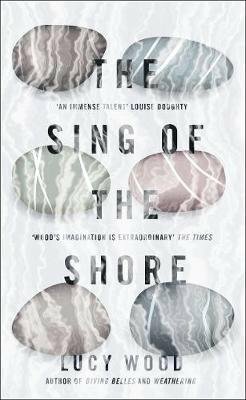 The Sing of the Shore (2018) by Lucy Wood, 4th Estate, 230 pages, hardback (source: personal copy). I was not familiar with Lucy Woods’ writing. Your review of her previous work as well as “The Sing of the Shore” was a clear exposition that prompts me to explore further. Thank you. Thanks for your comment, Mike. I’m really pleased that my reviews have inspired you to try her work. I hope you enjoy it. Diving Belles remains one of my favourite collections of recent years. I’ve still to read Weathering, bizarrely, but am really looking forward to this too now. She’s a definite talent to my mind. One who merits wider praise than she gets (and I’m aware she does get praise). Thanks, Max. I’m sure you’ll enjoy both this and Weathering. I agree that Wood is under-appreciated despite everything. To my mind, she should be up there with the likes of Melissa Harrison and Daisy Johnson in terms of recognition. She ought to be more widely known.